I understand we are supposed to be terrified of Iran. I just can’t figure out why. Yes, there is the possibility they could build a nuclear weapon. They claim they don’t want to, and the CIA and Mossad haven’t found evidence that Iran has an active nuclear weapons program. Of course, most of us don’t want to see Iran, or any other country, acquire nuclear weapons. But even if Iran was able to build a nuclear weapon, what could they do with it? At least nine other countries have their own stockpiles. 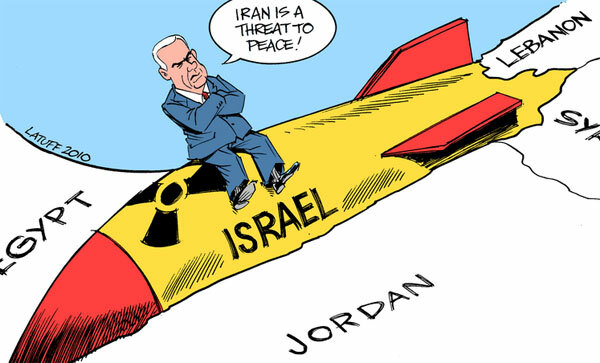 The United States has thousands of nuclear warheads, and Israel is reported to have dozens. This entry was posted in foreign policy, Iran, war and tagged Bibi Netanyahu, CIA, Mossad, nuclear weapons. Bookmark the permalink.